June 2016 - Sonbuilt Custom Homes Ltd. 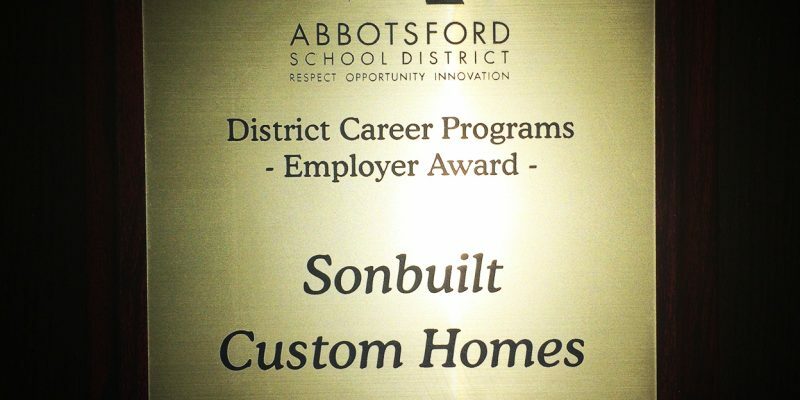 It was an honour this afternoon to receive the Employer Award from the Abbotsford School District. 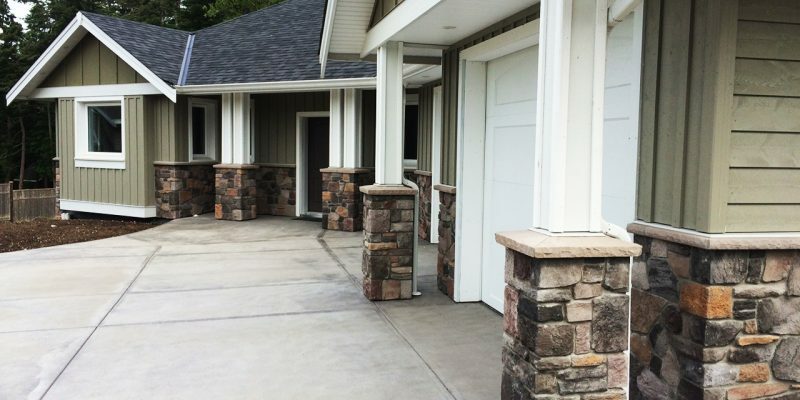 Sonbuilt Custom Homes values apprentices who want to become certified tradespeople. The District Career Program in Abbotsford offers students a variety of career and technical training while completing their regular high school courses. Students can choose from a variety of trades, technical and/or university transition programs. We appreciate the opportunity to work with students who intend to become certified carpenters. Thank you Abbotsford! We are thrilled to receive this award! Designing a home for main level living makes practical sense as we transition into the empty nest years. A well designed rancher will accommodate many years of comfort and ensures a safe living environment in the event mobility needs change. 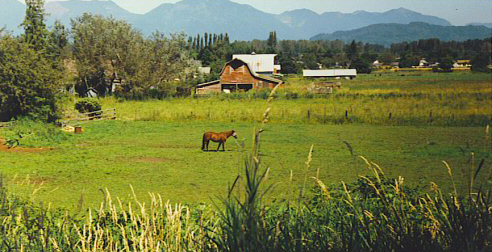 We are frequently asked to build ranchers – homes in which every day living can take place all on the main level. Our homes typically include generous kitchen spaces for entertaining guests, a master bedroom and spacious ensuite, and a well-equipped laundry room with lots of storage. These rooms are often all on one level along with other spaces usually found on a main level. All of your everyday living can be done without needing to use stairs. Ranchers became uniquely special to me as I watched my father-in-law transition in his later years from a strong, vibrant individual, to someone who struggled to walk and care for himself adequately. He desperately wished to live at home. I am fortunate that he was able to spend his final year of life in his home that did have the space and design necessary to support his changing his mobility needs. The experience of assisting my aging father reinforced in my mind the importance of designing homes to suit current and future needs. If you are considering a rancher, a beautiful, well designed home that supports one level living and an active lifestyle at the same time, give us a call at (604) 626-4688 or contact us through our website. Be sure to check out Our Portfolio page to see some of the ranchers we have designed and built. And finally, visit our Aging in Place webpage! Building Science – What is It? In the past, designers and builders considered each aspect of a home – foundation, walls, windows, roof, plumbing, electrical, all the parts that make up the home – individually. Today, we know all aspects of a home work together as a system to create a comfortable, durable, healthy living environment. Balance all these components together and your home will be far more energy efficient than a home in which these aspects are not working together in harmony. The study of homes as a system is called Building Science. Each component will affect the overall performance of your home in terms of energy efficiency, durability, and longevity. When the systems in your home are not working together, the overall health of your family could be compromised through poor indoor air quality, mold growth, and poor ventilation. Think about your current home. Do you see any concerns? Building to the standard BC Building Code is not enough to ensure your home is a healthy place for you and your family. It is the minimum standard, but by no means a healthy standard. If you are considering building a new home, ensure your builder is well qualified to build a healthy home. This is probably going to be the biggest investment of your life. Make it a healthy one! For more information on healthy living environments, download a copy of “Moisture and Air Guide”, by the Canadian Mortgage and Housing Council.